GB Railfreight will run a charity tour over four days in September, to celebrate its 15th anniversary. Fifteen locomotives from its fleet are due to be used. The tour runs on September 8-11 as far north as Inverness, with an overnight train also part of the plans. It will feature Classes 20, ‘47’, ‘59’, ‘66/7’, ‘73/1’, ‘73/9’, ‘86’ and ‘92’, and will include taking locomotives away from their usual operating areas with ‘20s’ running to Inverness, ‘73/1s’ visiting London King’s Cross and ‘73/9s’ to Great Yarmouth. The tour will also feature the first main line passenger runs of 59003 Yeoman Highlander since it returned to the UK, while the final-built Class 66 (66779 Evening Star) is also expected to feature. All funds raised will be donated to British Heart Foundation, The Ripple Project and Woking Homes, all charities nominated by GBRf employees. The train will be formed of air-conditioned Mk 2s with First Class and Standard Class accommodation. There will be a buffet car as well as a sales stand with various memorabilia available for purchase. Additionally, for passengers travelling on all five trains, GBRf will offer a Platinum Class that will include a limited edition commemorative mug, a goody bag, and free tea and coffee for the duration of the trip. There will also be an offer for a First Class table for two supplement of £10 per person per day. Fares are available for each train individually, and also for the entire event, which offers a significant discount. Bookings will open in April. 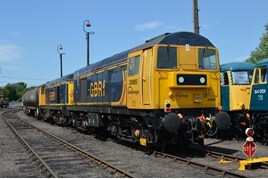 Full details of how to book will be advertised on GB Railfreight’s website - http://gbrfcharityrailtours.co.uk/ - as well as on a Facebook page event. Organisers say that because of the multi-traction nature of this event and the broad geographical coverage, this train will only be able to be booked in advance, and they will not be accepting any ‘pay on the day’ customers. No part fares will be available either. Traction features a pair of Class 20s and a pair of Class 73/1s working top-and-tail for the duration. GBRf takes a trip round its stomping ground of East Anglia, covering unusual routes and using some unusual traction in the process. In order to cover some distance, GBRf is running overnight to Scotland. This is a separate train, as far as fares are concerned. Note: London-Reading is an add-on to the main tour as part of the move to take stock back to the depot. Very tempting although day 3 could turn out a little noisy with the sound of snoring even with the class 20's rattling away at the front. Might not be a bad idea to keep the whole tour people separate from the day trippers to avoid upsets. Do the MK 2's have power sockets for charging cameras etc.